Summertime in St. Mary’s County ushers in an annual tradition … the Summerstock musical performance. 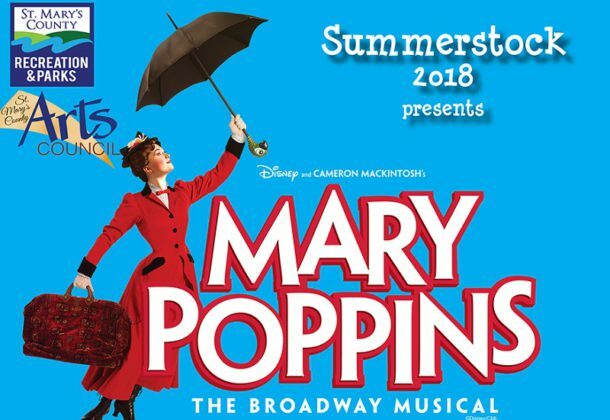 This year’s production will be Mary Poppins, a story based on the book by Julian Fellowes and musical from the stories of P.I. Travers and the Walt Disney Film. The original music and lyrics are by Richard M. Sherman and Robert B. Sherman. Show dates are Friday, July 20 – Sunday, July 22, and Friday, July 27 – Sunday, July 29. Performances will be held in the Great Mills High School auditorium at 7 pm July 20, 21, 27, and 28; 1 pm July 21 and 28, and 3 pm July 22 and 29. Evening ticket prices are $14 for adults, $10 for seniors 60 years and older and $6 for children 10 and younger. Matinee prices are $10 for adults, $8 for seniors 60 years and older and $4 for children 10 and younger. Tickets are available online here or may be purchased at the Recreation & Parks main office in Leonardtown. Patrons purchasing tickets online must print their tickets and bring them to the show for admittance. Online ticket purchases are highly encouraged due to the possibility of shows selling out. Online tickets must be purchased no later than noon the Friday before the show you plan on attending. Doors will open one hour before each performance for ticket sales. The auditorium will open 30 minutes prior to the start of each show for general seating. Only cash will be accepted for ticket sales at the door. Summerstock is a presentation of the St. Mary’s County Department of Recreation and Parks and the St. Mary’s County Arts Council. For more information, call 301-475-4200 *1800.